Everything concerning the Samsung CLX-6260FW color laser multifunction ($1,000 as of 11/28/2012) has class. The appearance and controls, the output, and even the software are first-rate. Even better, the CLX-6260FW wakes up quickly and performs its tasks with skill. Just keep an eye on the toner costs, which can be a little expensive. The CLX-6260FW has all the connectivity most situations require: Wi-Fi, USB, and gigabit ethernet. The unit is controlled via a 4.3-inch touchscreen, and the menus and options are arranged intuitively. As the CLX-6260FW faxes, a numeric keypad is present for dialing phone numbers as well as entering four-digit secure printing PINs. In addition to the usual cancel and other buttons, there's also an Eco button that switches the printer into economy mode where it uses less toner-- particularly apropos with this unit. The CLX-6260FW comes standard with 512MB of memory, and it’s upgradeable to 1GB. There's also a USB-to-parallel-port option for $100. The specified monthly duty cycle is 60,000 pages, and the unit carries a one-year warranty. The provided software supports all the chores of which the CLX-6260FW is capable (copy/fax/print/scan), as well as email and Internet printing. There's also scanning directly to social media sites and even conversion to e-Books. The CLX-6260FW seems a bit short in standard paper capacity, even for a small workgroup. The bottom cassette holds 250 sheets, and the multi-purpose tray that folds down from just above it holds 50 sheets. The output tray, which is somewhat claustrophobically situated beneath the top-mounted scanner, holds 100 sheets. An affordable $189.99, 520-sheet, bottom-mounted auxiliary tray is available to increase total capacity to 820 sheets. The ADF (automatic document feeder) holds 100 sheets. Two-sided (duplex) printing and scanning are both fully automated. Mac users win the speed game, for once: The CLX-6260FW is posted better-than-average speeds on our Mac platform testing, but just middling speeds on our PC platform testing. Text and monochrome documents exit the unit at an aggregate 12.6 pages per minute (ppm) on the PC and 12.9 ppm on the Mac. Snapshot-sized, 4-by-6-inch photos print at 3.3 ppm to plain paper, and at about 1.25 ppm to laser glossy paper. On the Mac, our color PDF newsletter printed at 6.4 ppm, and a full-page color photo at 1.6 ppm. Copies exited at 4.5 ppm. Scan speeds were also decently fast. Black output from the CLX-6260FW is sharp and then some--as good, or better than you see from any printer in its class. The color output is also exceptional for a laser printer, with a realistic, albeit slightly subdued palette. All in all, you're not likely to complain about anything that exits this printer. 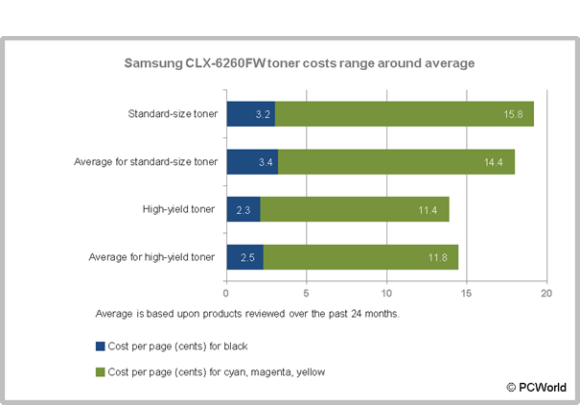 The toner costs for the CLX-6260FW range from average to pricey, so it'll pay to shop around. Based on average retail pricing data provided by Samsung, the standard-size, 2,000-page black cartridge sells for about $64, or a reasonable 3.2 cents per page (cpp). The $79, 1,500-page cyan, magenta, and yellow cartridges work out to 5.3 cpp apiece. That totals 19 cents for a standard four-color page, which is a littlle costlier than average. Better deals are to be had with the high-capacity $141, 6,000-page black, an affordable 2.3 cpp; and the $132, 3,500-page color cartridges, 3.8 cpp each, for a total of 13.7 cents for a four-color page. The Samsung CLX-6260FW has nice as its speed, output and features, making it a solid choice for small workgroups. Toner range reasonably above and below average. The HP LaserJet Pro 400 Color MFP M475dw has a similar features and a lower unit price, but its toner is a little more expensive. Correction: This article was corrected to reflect average retail pricing for the toner cartridges instead of list pricing. As a result, costs per page are lower, which raises the product's overall rating. Impressive print quality is the highlight of this small workgroup unit. Speed and features are competent. Toner costs range from average to a little pricey.